This is a partial list of sources where you can purchase native wild rice that has been hand-harvested from lakes and rivers in the Great Lakes region. If you know of other sources please contact us so we can add them to this list. TRIBAL RICE HARVESTERS - please call first to order rice. 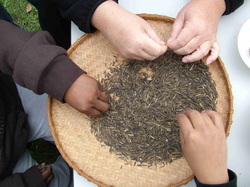 Native Harvest - selling hand-harvested wild rice, birch bark winnowing trays, and more. Native Anishinaabe Indian owned. White Earth Nation. Chippewa Indians. Red Lake Nation Foods - selling hand-harvested and cultivated wild rice, and more. Where the Wild Foods Grow - Products include hand-harvested, hand-parched Michigan wild rice, both tribal and non-tribal, other wild foods. Lake Region Wild Rice Company - Hand harvested by Tribal members, hand parched. Moose Lake Wild Rice - Carries both wild and cultivated wild rice, recipe books, and more. Near Deer River, Minnesota.